Concrete rubble from the face of the St. Francis Dam, in San Francisquito Canyon. According to dam historian Frank Rock, this is block 19, the only remaining fragment with the recognizable stair steps. Undated, unattributed 3¼x5-inch glossy print from a flea market. One of two views. Construction on the 600-foot-long, 185-foot-high St. Francis Dam started in August 1924. With a 12.5-billion-gallon capacity, the reservoir began to fill with water on March 1, 1926. It was completed two months later. 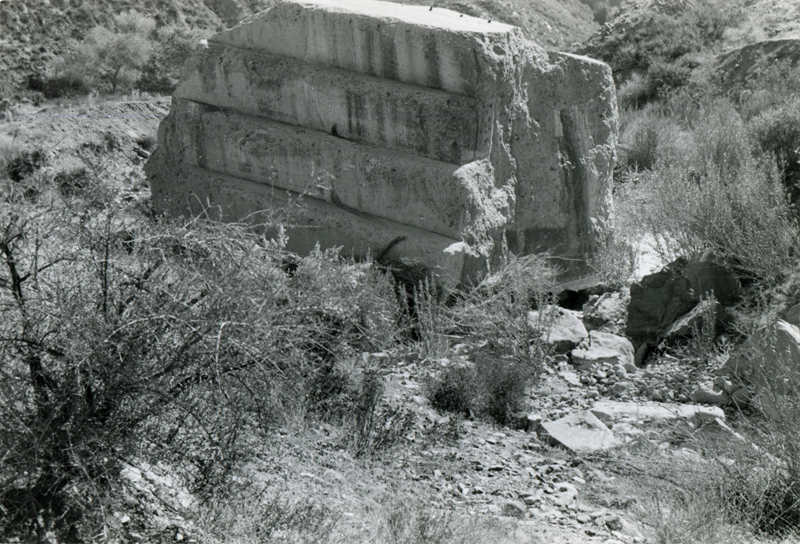 At 11:57:30 p.m. on March 12, 1928, the dam failed, sending a 180-foot-high wall of water crashing down San Francisquito Canyon. An estimated 411 people lay dead by the time the floodwaters reached the Pacific Ocean south of Ventura 5½ hours later. DI2804: 19200 dpi jpeg from original print.